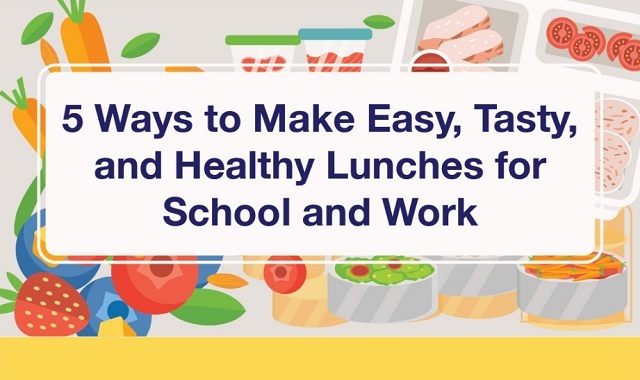 5 ways to make easy, tasty, and healthy lunches for school and work #infographic ~ Visualistan '+g+"
Whether for schoolkids or working adults, assembling wholesome yet delectable lunches five days a week can be challenging. Going out to lunch or giving your kids money so they can buy a meal in the cafeteria isn’t just expensive; it may take a toll on everyone’s health, too. No matter how hectic your schedule, you can pack easy, healthy, tasty homemade lunches for you and your kids. Here are tips and ideas to get started.